Ireland ran Italy around Soldier Field until the Azurri wore out. This is the way to play Italy who were brave but were as blunt as an old razor blade by the end of the game. 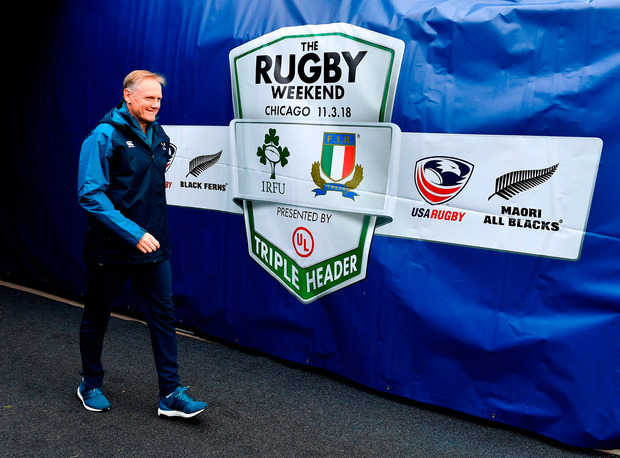 This winning streak of two might well tempt the IRFU to move all games to Soldier Field. Sure isn't Chicago a home away from home. There are more Irish pubs in the Windy City than you would find back home, even more so nowadays, what with all the closures and clearances. The Irish and the Italians get on very well. There have been so many Irish Italian marriages here in Chicago although there was some bother back in the days when rival factions fought turf wars, and not even a sod of turf was cut. Blood was spilt. Men like Machine Gun Mc Gurn were highly thought of in the killing streets. If only Machine Gun had the Irish pack with him. He was killed by the Mafia because he killed other people. The Irish gained revenge for Machine Gun on Saturday. Although it might be going a little bit too far to suggest the rallying cry when a try was scored was "this one is for Machine Gun Mc Gurn." The stories from Soldier Field were tales of a happy occasion with many Irish travelling to Chicago from all over the United States. I'm told the undocumented seldom leave their home cities now that Trump has cracked down on our emigrants. The gaps in the stands told their own story. There wasn't a cross word and the game mirrored the harmony off the field. Joey the Jinks was outstanding at 10. Armour Larmour scored a spectacular hat trick. Ring- a- Ring -a- Ringrose was excellent all through. He has filled out. Nicknames like Machine Gun were made up by the press and nearly all the good ones had some bit of alliteration or assonance. Maybe we could call our beloved coach "Don't go Joe." We must do all we can to keep Joe Schmidt. The IRFU will not let money become an issue but Joe is lonesome for home, like all emigrants, even though Joe is very much Irish in our eyes. Joe has now spent eight years of his life in Ireland. We will know of his decision before the end of the month. For a while it looked like Joe was heading for either New Zealand or The Lions. If he goes for The Lions job the possibility is he will come back to Irish team a year later and this could be seen as no more than a sabbatical. But if Joe decides to go to New Zealand this could be the most disastrous leaving since The Flight of the Earls in 1607, which led to the end of the primacy of the Gaelic chieftains. The coach is the most important person in every team. You will not win anything without good players. We all know that but would Dublin be heading for an almost certain five in a row if Jim Gavin wasn't in charge? Some of the Munster fans felt Joe was more likely to pick Leinster players. There may have been some truth in this at the beginning of his reign but that had more to do with the fact he wanted players who understood his ways when there was hardly any lead in time to the tests. No one could accuse Joe of any bias. He always put Ireland first. Take the case of Joey Carbery who is blossoming since he joined Munster. Joe persuaded Joey to move south. Carbery has had a run of games at 10 for the first time in his career. Joe is building for the present but his legacy will remain if he does go. I watched England , Wales and Scotland play on Saturday. I gave a good bit of the day on the couch- the one at home. One of my friends said if Herself ever divorces you that couch will be there before the judge in the divorce courts with the words Exhibit A tagged on the side. As the shrinks are fond of saying "no day on the couch is ever wasted". The Irish second team is better than any of the Triple Crown Countries. Yes we still need Jonathan Sexton and Conor Murray to be in good health for Japan. But their understudies are closing the gap. Jonathan was nominated for World Rugby Player of the year this week. He is the first of my Godchildren to be nominated for the award. Woody was world Player of the Year back in 2001 and is the only Irish player to have won the prestigious award. Ireland stopped England winning the Grand Slam in October of that year. Yes October. The 6 Nations was postponed because of Foot and Mouth. Woody was outstanding and scored a great try. There is no doubt but that Woody was best in the world for a good few years and not just in 2001. Conor Murray must have been desperately disappointed not to have made the short list. He is the best scrum half in the world. Maybe the judges thought Limerick had won enough this year. The award for comeback of the year goes to Ian Mc Kinley who overcame terrible eye injuries to play against his native Ireland. Joe wins the best coach award. He is still making up his mind. Please Don't go Joe.